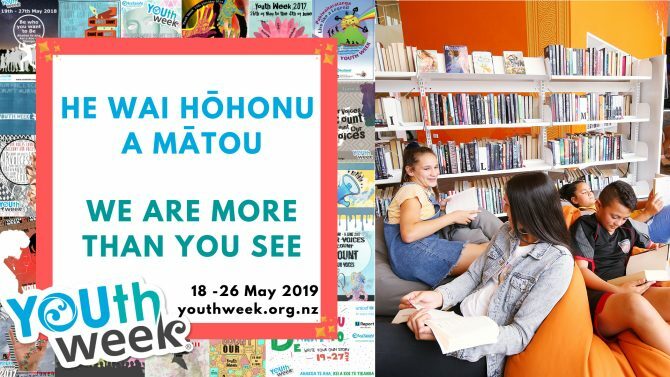 Youth Week 2019 is on from Saturday 18 May to Sunday 26 May 2019. The theme is "We are more than you see" "He wai hōhonu a mātou" (literally, we are deep waters, thus referring to unseen depths). Celebrate Youth Week and join us in activities around the theme "We are more than you see!" Enter your best artwork that speaks to the theme: “We are more than you see!” and WIN some great prizes. Come down to Shirley Library to use our art supplies and get creative inspiration. Winners’ artwork will be displayed on the library website. Submissions welcome throughout Youth Week — please submit in person at Shirley Library by Sunday 26 May. Competition open to ages 11 to 24 years. Rhyme. Rhythm. Record. That’s the starter pack for your first rap! Come and learn the basics of rap writing and then put them into practice at the Tūranga studio. No experience required. Suitable for ages 12 to 24. Bookings required (phone 941-7923 or email library@ccc.govt.nz). Want to write a poem but struggle to find the right words? Give black-out poetry a go. We’ll be taking pages from old books and, with the help of some Sharpies, creating our own poems from their words. Get creative and do it badly! Join us for an evening of creating truly bad art. The tackier, the better! We’ll finish with an exhibition of your pieces of “art” where you’ll vote to decide who has made the Best Bad Art. Join comic character illustrator/ fantasy artist Ryan Green for a workshop on how to make your own characters come to life. Suitable for ages 10 to 24. Bookings required (phone 941-7923 or email library@ccc.govt.nz). We’re celebrating Youth Week and Music Month with a dance party. Follow along to the dance moves on the video wall and let Just Dance 2019 decide who really has the best moves! Bounce is a bunch of tips, ideas and inspiration to help you live life well. Bounce is a New Zealand Red Cross project that partners with young people for young people. The Ministry of Youth Development (Te Manatu Whakahiato Taiohi) promotes the interests of young people aged between 12 and 24 years inclusive. The Ministry encourages and assists young people to be involved in the social, educational, economic and cultural development of New Zealand, both locally and nationally. Free national legal service for those under 25 years. The Youth Parliament takes place every three years and 2016 was the most recent. It was an opportunity for young New Zealanders to learn about New Zealand’s democracy and influence public decision-making. Our page on health services for young people in Christchurch.